Between hyper-developed hotspots, main drags in up-and-comers, and those genuinely avoidable areas, there can often be found a city’s “just-right” zones. They aren’t commonly known, but these micro-neighborhoods often hide within them real estate gems coupled with perfectly offbeat vibes. 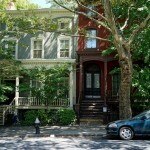 Continuing our Goldilocks Blocks series, this week we turn to Brooklyn. 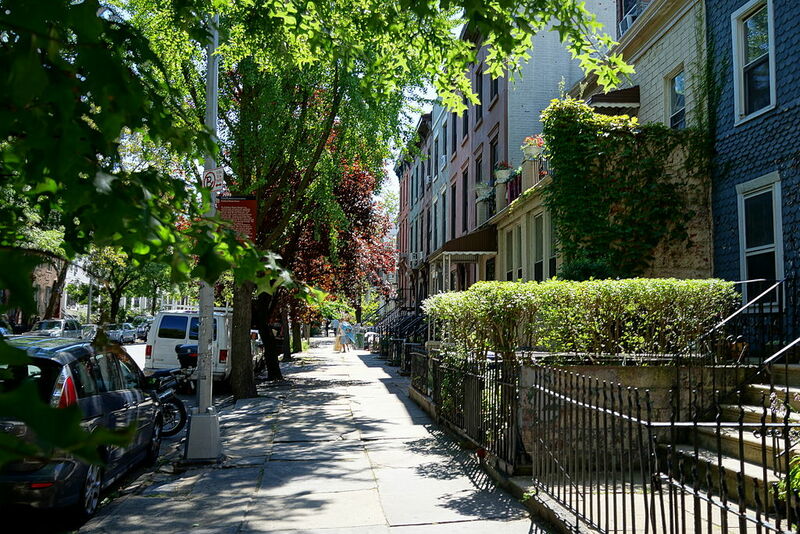 The culturally rich, architecturally stunning Brooklyn neighborhoods of Fort Greene and Clinton Hill need little introduction. The Brooklyn Navy Yard to the north is busily growing as a start-up business incubator and creative and commercial hub. An “in-between” zone—the sort of area that engenders a question mark and a furrowed brow when perusing neighborhood maps—lies just north of Myrtle Avenue and south of the Navy Yard. Known as Wallabout, the area was named for Wallabout Bay to the north, much of which was filled in to create the Navy Yard in the 19th century. Unique among its neighbors, a block-long stretch of this border district feels more like a small-town side street than a growing urban crossroads. Vanderbilt Avenue historic district. Image: Wikimedia Commons. Though far from a household name, the diminutive Wallabout neighborhood has increasingly been in the news. 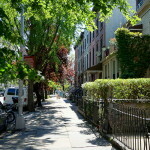 In 2011, the Wallabout Historic District was officially listed on the New York State Register of Historic Places; in fact, the listing includes only about 50 properties on a tiny one-square-block stretch of Vanderbilt Avenue between Myrtle and Park Avenues. 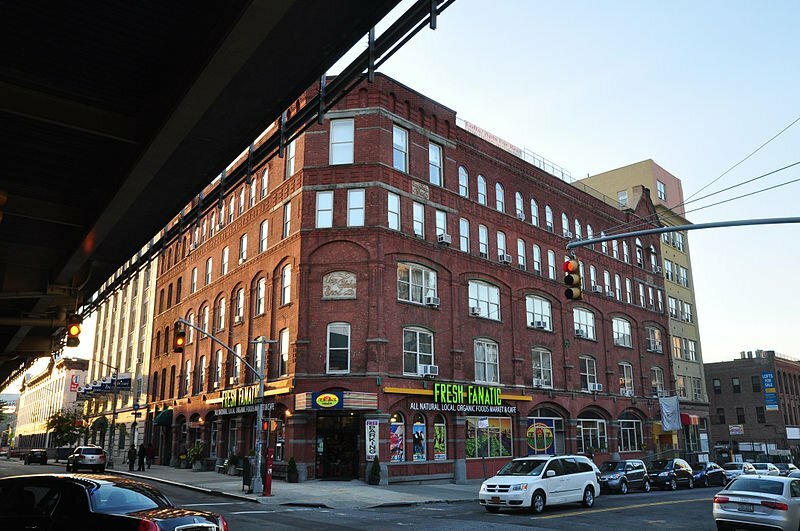 The city’s Landmarks Preservation Commission subsequently designated the block in a unanimous vote. This understated sweet spot of a street—sloping gently downhill just below the shadow of the BQE overpass—feels like an accidental discovery when you find yourself on it. First, those little wood frame houses (they’re the reason for the historic designation). 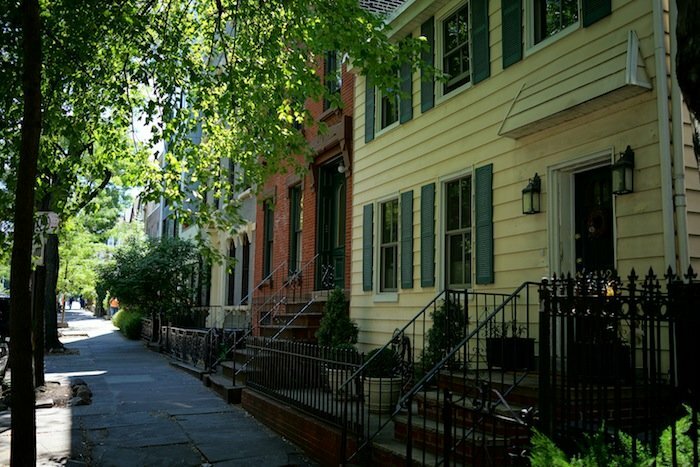 The area has the largest concentration of pre-Civil War wood frame houses in New York City—and most of them can be found on this block. 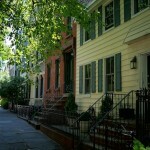 Many of these homes have been lovingly restored, comprising a quaint and colorful streetscape. Beyond the wood frames, housing styles on the block are many, from classic Italianate brownstones to an eclectic mix of brick, stone and new-construction homes. There’s a picket-fence-and-front-porch vibe here; the recent landmarking provides assurance that this feeling—and the historic homes that create it—will be preserved. The state register listing gives owners access to state and federal restoration tax credits, grants and other types of assistance. Wood frame house on Vanderbilt Avenue: Image: Wikimedia Commons. Neighbors—many of whom bought their homes years ago—love the block and get to know one another. 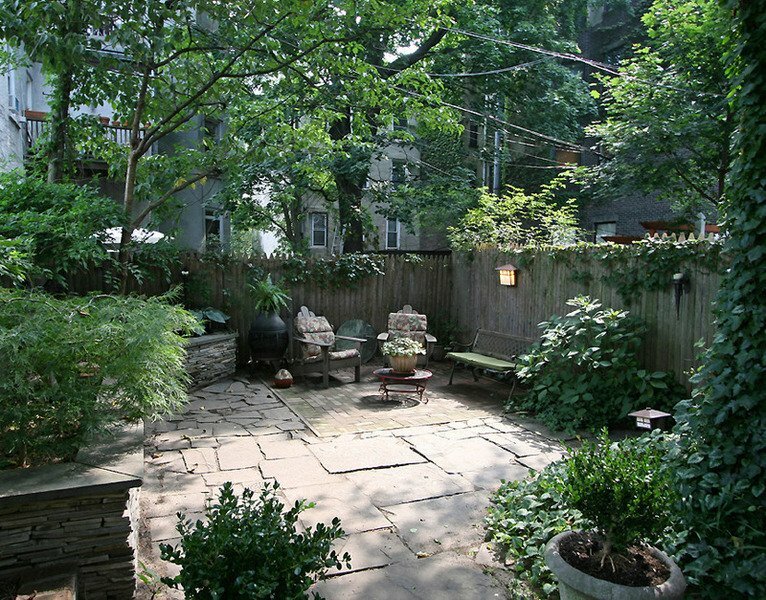 Newcomers are equally pleased; actress/writer/director Lake Bell recently purchased a house on the newly-landmarked block; a lushly-landscaped “Zen garden” was undoubtedly part of its appeal. The same house and garden are the former home of ParlorJazz, a locally-known salon event that hosted jazz performances in an intimate townhouse setting. While this unique block is currently the only landmarked block in the Wallabout micro-neighborhood, local activists hope to obtain broader landmark status in the near future. 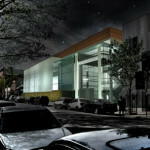 As Vanderbilt Avenue continues south down the Fort Greene/Clinton Hill border, the newly-minted St. Joseph’s College athletic facility and fitness center is a glass-walled modern gem that casts a welcoming glow after dark. Next door at 208 Vanderbilt is the sleek black facade of the artists’ studio designed by David Adjaye and David Hotson; the building is among the neighborhood’s more noteworthy modern structures and was recently featured in Diana Lind’s book, Brooklyn Modern. The Clermont Greene condominium building, built in 2008, is here also. Further down Vanderbilt lie some of the neighborhood’s grandest historic townhouses. 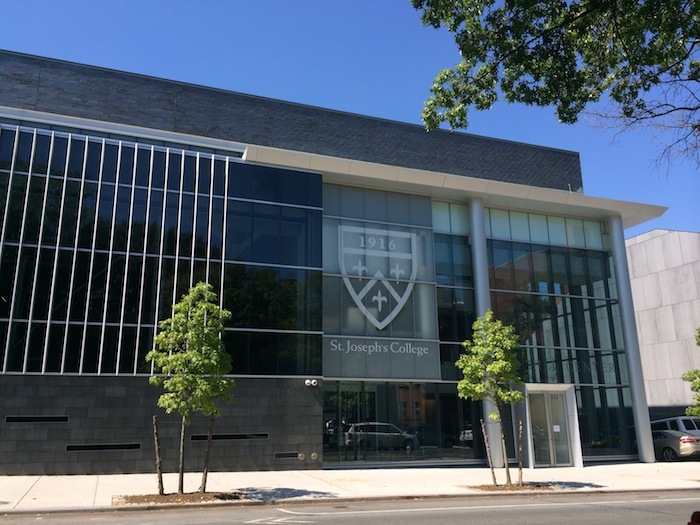 New athletic and fitness center for St. Joseph’s College on Vanderbilt Avenue. Image courtesy of SJCNY. To the north on Park Avenue, the BQE overpass almost hides the 3,500-square-foot organic grocery, Fresh Fanatic, (possibly due to nearby Pratt Institute, there are several 24-hour gourmet grocery stores within close proximity) housed in the massive historic brick Chocolate Factory loft building. The former Tootsie Roll factory also contains 75 apartments. Continuing north, popular cafes like Brooklyn Roasting Company and Hungry Ghost have arrived to welcome the influx of new employees to a revitalized Navy Yard. 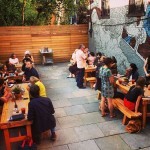 Around the corner on Myrtle Avenue you’ll find an explosion—more seem to arrive almost daily—of inventive and classic restaurants, specialty food markets, cafes and bars, joined by banks, drugstores and a Connecticut Muffin shop, giving the avenue a college town Main Street feel. 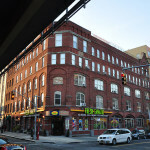 The historic Rockwood Chocolate Factory loft apartment building. 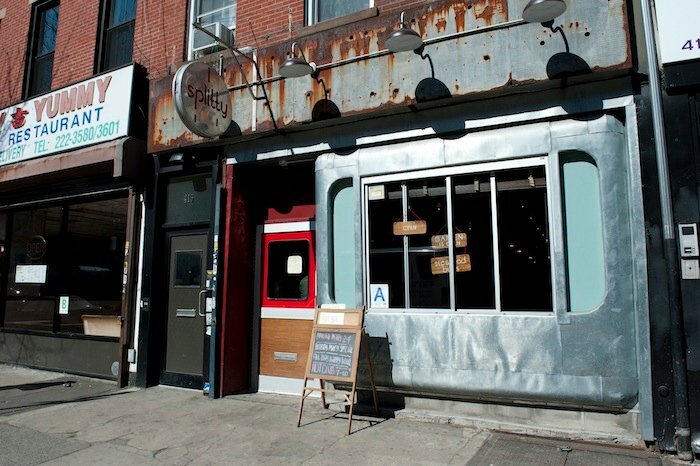 Splitty restaurant and bar serves steamed buns and cocktails on Myrtle Avenue. Image courtesy of Splitty. Vibe: A quirky, quiet and pretty residential block with historic houses and apartments both old and new, at prices that haven’t quite caught up with the neighborhood’s big-ticket reputation; attractive new construction and a wealth of amenities right around the corner, with an up-and-coming new frontier just to the north. Drawbacks: There’s that BQE, and it’s right there. The closer you get, the more you can hear (and see) it, though people who live there say they’re used to it; mid-block and lower, you don’t hear it at all. Also, public transportation: You’re five long blocks from the G train, and three more blocks from the C train to Manhattan, though residents say the bus that stops just at the end of the block gets you to a get-anywhere subway hub in 5 minutes. Actress/director Lake Bell owns this dreamy garden in the Wallabout Historic District; it was previously part of the ParlorJazz venue. 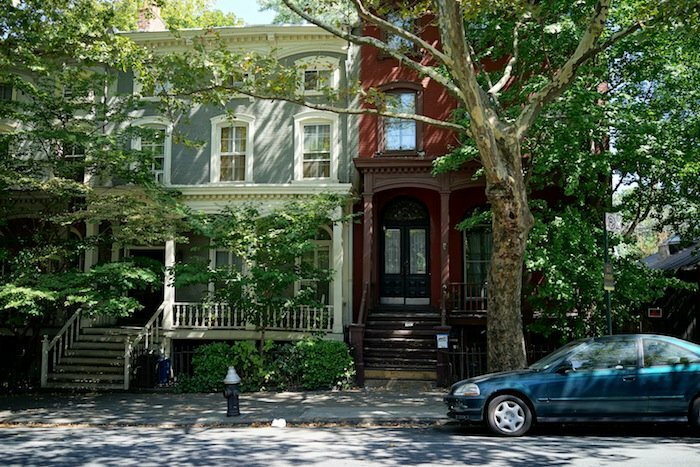 Historic homes on Vanderbilt Avenue. Image: Wikimedia Commons. 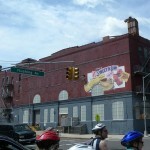 Former Sweet n Low factory on Flushing Avenue in Wallabout. Image: Wikimedia Commons. Back garden at Peck’s Homemade on Myrtle Avenue. 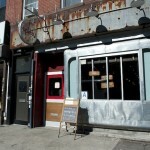 Splitty restaurant and bar serves steamed buns and cocktails on Myrtle Avenue. 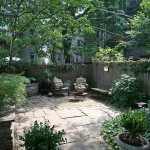 Actress/director Lake Bell owns this dreamy garden; it was previously part of the ParlorJazz venue.